BTS appears to have decided to put TV promotions on the back burner and focus on its concerts while in Los Angeles. “I want BTS to come on my show and perform serendipity so bad! Maybe we could even sing it in a #CarpoolKaraoke?” Corden wrote in a tweet on Aug. 29, which had been liked over 243,000 times as of Wednesday. But George Pennacchio, a reporter at local TV station ABC7, soon broke the news that the group would not be issuing interviews at all. “I hate to break this news, but I learned today that BTS has now decided to turn down all interview requests while they’re in LA. I’m told the guys want to focus on their shows and are doing absolutely nothing else,” he said. 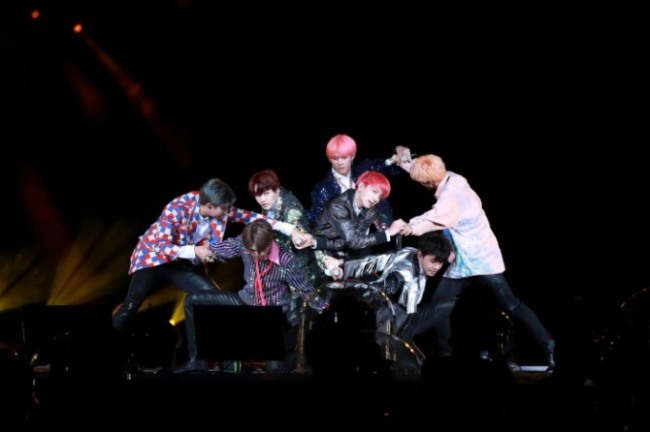 The Southern California city is BTS’ first stop outside Korea in its “Love Yourself” world tour, which will see the groundbreaking K-pop act travel to 16 cities across the world. The group will also meet with local fans for “A Conversation With BTS” at the Grammy Museum on Tuesday.